I’ve done a lot of dumb things in my life, but one that tops the charts is having a doggie playdate at my house. Here’s my story of what went wrong and a few tips to save you — and your dog! — from disaster when setting up doggie playdates. Yikes! Don’t let a doggie playdate turn aggressive. Check out one cautionary tale and some tips below. Photography by Aree / Shutterstock. At the time, we had Axle and a female dog we had adopted from our local shelter. I had a friend who also had a dog she adopted from the same shelter. We’ll call him “Red.” He was a super sweet and friendly dog, so of course we wanted to have playdates — but I just didn’t want Axle to be part of them. He had a lot of bad experiences under his collar, and I just wasn’t comfortable with him around other males — particularly large and strong ones. She came over, and Red hit it off with our girl dog, who we’ll call “Bella,” right away. While Red and Bella were playing, my friend asked me about Axle. I was still hesitant, but I finally gave in. I let him out of his crate and let him see Red through the glass on the back door. He looked excited and ready to play. I let him out in the yard, and Red immediately went stiff. He clearly wasn’t comfortable with the newcomer, and Axle reciprocated the feelings. They got into a tiff. Was it dominance? Was it general dislike? I don’t know. It was very brief and we quickly separated them. I put Axle back in his crate, and I went back outside to find my friend holding Bella and Red apart. At the time, she told me that Red had jumped on Bella, but she later changed the story to the other way around. Either way, I had to put Bella inside before I could check on Red. Besides looking sheepish, Red was fine. He had a small wound on the top of his head. We talked about it, and everything seemed fine … until a month later. Red had left Axle with bite marks on his neck, which healed quickly. Red, on the other hand, still had a spot on top of his head. She posted his picture out on Facebook and pretty much told the world that Axle was a big, bad dog that hurt her Red. We argued about it, and the matter seemed settled. Many months later, she shared a picture of Red playing with another male and expressed her surprised at them getting along. 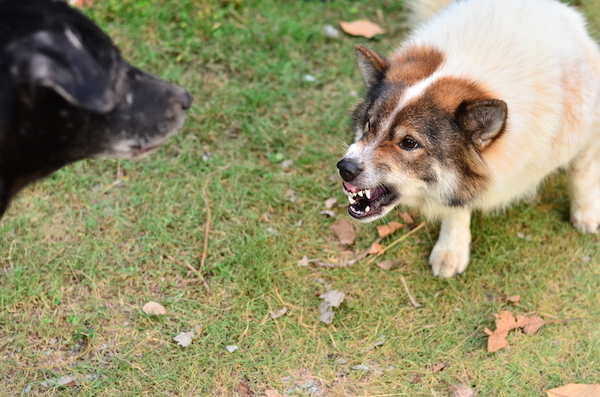 She claimed that, ever since the “really bad fight” with Axle, Red had become aggressive toward other males. I think it goes without saying that she and I are no longer friends. Both Axle and Red are sweet dogs. Axle had some things happen in his past that didn’t set him up for success with another male dog, and Red came with an unknown history. If you’ve read everything so far, I think you’ve probably found a lot of the things I did wrong. Here’s a list of rules to follow for playdates. This is especially important if the dogs have never met before. It’s a good idea to follow BAD RAP’s model for introducing dogs. Like they say, it’s best to take things slow. I didn’t want Axle involved in a playdate for a reason, and I failed him (and Red) by not listening to my gut feelings. I knew Axle probably wouldn’t like spending time with another male dog. This kind of follows No. 2, but it’s extra important. If your dog does better with opposite-gender dogs, don’t pair him or her with a same gender dog and expect them to get along. Does your dog have a size preference in a playmate? Does she prefer to chase or be chased? These are all important factors in deciding whether a playdate is right for your dog or not. If you aren’t comfortable with having the playdate, you won’t be doing your dog any justice by going ahead anyway. Be polite, but firm. The other person will understand or they won’t; you have to put your dog’s safety first. Separate the dogs and check for injuries. Document any injuries (or the lack thereof) with pictures. Have an open and honest talk with the other person, and make sure you’re on the same page as to what happened and where to go from there. Playdates can be a great way to socialize your dogs, but only if you set everyone involved up for success! Tell us: Do you have playdates with your dog? Has anything ever gone wrong? Let us know in the comments. Thumbnail: Photography by Robynrg / Shutterstock. The post 5 Ways to Avoid Disaster During Your Dog’s Next Playdate appeared first on Dogster.